Stella and Sophia, our five-year-old twins, recently declared that we needed more Halloween blow-ups for our front yard. We already had some pumpkins, scarecrows, and a blow-up skeleton. I agreed that we needed more as Halloween yard decorations are a big deal in our Chicago neighborhood. We jumped in the mini-van and headed to Walmart. We looked at the Halloween blow-ups but decided they were too small. We walked down an aisle that was overflowing with shelves of candy. As we turned the corner Stella grabbed my hand and gasped, “Mom! 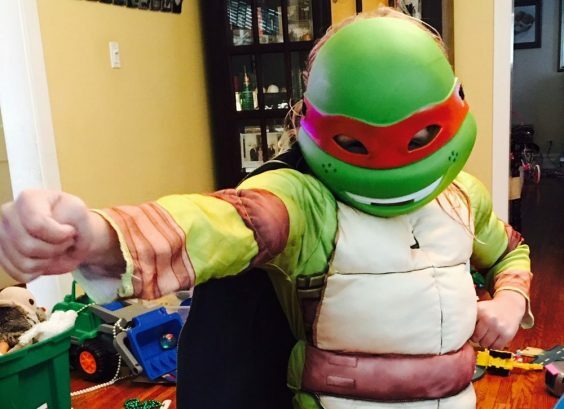 They have ninja turtle costumes!” She continued, “Can we get Mikey? Please! Please!” I couldn’t help but smile at her enthusiasm. We had already discussed Halloween costumes so I asked her about her previous decision to be Gekko from PJ Masks. Stella likes to fight crime. She quickly declared that the ninja turtle costume was way better. I smiled again and said yes. We began digging through the costumes to find Mikey, the orange Teenage Mutant Ninja Turtle, which was her favorite. Fortunately, we found the Mikey costume in her size. I handed the costume to her and as she held it she realized it had “muscles” built into the costume. She once again gasped, “Mom! I’m going to have muscles! I’m going to be so strong!” It was an awesome moment and I love our strong ninja. I asked her sister Sophia if she wanted a different costume and she quickly said that she still wanted to be Skye from Paw Patrol. She was all set. We checked out and headed home. The girls immediately put on their Halloween costumes and dashed around the house. They jumped off the couch, climbed under tables, and swooshed around chairs. They were fighting crime and saving the day. It was awesome watching their imaginations in action and I loved that they wanted to be strong girls for Halloween. These two dream big. Last year, Stella was a firefighter and Sophia was a policeman. When you ask them what they want to be when they grow up Stella will say a firefighter, a doctor and now a ninja turtle. Sophia will tell you she is going to be a policeman and an artist. As quickly as they change costumes they add a dream to their list which I think is just great. Now, I have to admit I’ve recently had my moments where I wistfully wished the girls would wear a princess dress or some super cute Pinterest inspired costume. About seven months ago Stella ditched all things pink and every bow in our house is gathering dust. Sophia loves Skye so much from Paw Patrol that she is decked out in purple 99% of the time. I look back on sweet Halloween pictures from when the girls were ladybugs and monkeys and they were so cute. Those pictures still melt my heart. But, as I watched them race up to me and tell me that they have caught the bad guys, had rescued stranded stuffed animals and saved our toy town I was so happy. There are so many tough headlines in the news these days that I quickly realized a strong girl who wants to save the day is more important than my light-hearted wish for a super cute costume. The girls picked costumes that reflect the strength and positive attitude that I want them to have on the inside and out. I also must confess that I love the character and values that Disney is highlighting with their princesses. They have worked hard to help young girls realize the importance of dreaming big, being kind, being brave, and finding strength within. So, this Halloween when a little princess comes to your door trick-or-treating I hope you see values behind the sparkle. Disney Junior has also been huge in our house and Stella has several Doc McStuffins costumes. It is awesome to watch her practice being a doctor. We think the Doc McStuffins creator, Chris Nee, is amazing and has done an incredible job of inspiring young girls to be doctors while teaching important health and safety lessons. Chris is at it again with another winning show Vampirina about another strong girl, Vee. Halloween is quickly approaching! If you are looking for some awesome and clever ideas for strong girls check out the Girl Empowerment Halloween Costume Guide on the A Mighty Girl website. Head over to Pinterest and search strong girl Halloween costumes and you’ll find great ideas for Rosie the Riveter, Matilda, and so many other strong gals. If your school, church, or community organization is hosting a Trunk-or-Treat or some other Halloween celebration take a look at the awesome Waldo app! Live the moment this Halloween and don’t worry about capturing every moment on your camera. You could help your family and friends capture pictures of your strong kids as they celebrate Halloween! And, you could do an easy fundraiser for your organization at the same time! To learn more check out the Waldo website! I hope you have a happy and safe Halloween filled with strong trick-or-treaters who are dreaming big!